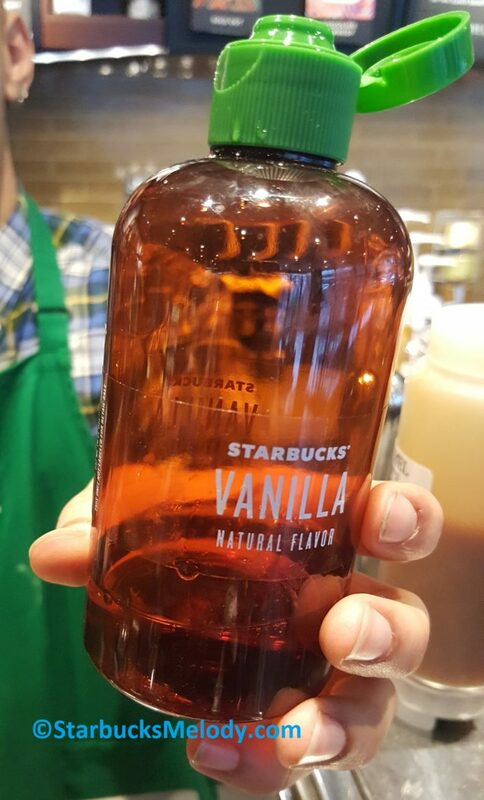 In Portland, Oregon, Starbucks is testing a new idea for your latte, Frappuccino or whatever: Your beverage flavored with a syrup extract and sugar on the side. Rather than large bottles of a sugary flavored syrup, your barista would add a flavor extract and then you can customize how much sugar you want in your drink. I asked to smell both the classic vanilla syrup (with sugar) and the vanilla extract, and I can say that the extract is much more aromatic. With this new system, the barista adds a certain number of shakes of an extract and then separately pumps in a simple syrup for the sweetener. It’s possible to order your drink with just flavor and no sugar. I tried this with a Cinnamon Dolce Syrup Crème Frappuccino. What I got was a beverage with very subtle flavor. You would think that it would be very cinnamon-y but it was plain and subtle. I would say that sugar seems to enhance the flavors like vanilla, hazelnut, caramel, or whatever you choose. While this idea sounds like a great idea on paper – separate the sugar from the flavor – I can see both some big pros and cons. Diabetics or others who are trying to control sugar in their lives can get a healthier drink option. It might be frustrating for baristas to have to explain this to every customer, especially in the drive-through. It could have a steep learning curve as customers try to figure out how they like their beverage. It seems like you get a much more inconsistent drink. When baristas pump syrups, the mechanism does a really great job of control how much syrup you get. Turning a bottle upside down and giving it a “shake” is going to give you a more inconsistent amount of extract. If the bottle is full, you’ll get more than when the bottle is nearing empty. A stronger shake might give you more extract than a gentle shake. Whether or not we like it, Americans love sugar. It’s not just Starbucks. If Americans really wanted to eat healthy, the candy aisle at a typical grocery store wouldn’t exist, and Girl Scouts would stop selling Girl Scout cookies. If someone wants a 20 pump caramel Latte, so be it. No drink judgment here. I can think of a million more damaging things that people do to their bodies on a regular basis. However, this entire system may just end up being very unappealing to the customers who want a very sweet beverage. They might be discouraged from coming back. And truthfully, most Americans are in love with carbohydrates, especially sugar. This kind of idea has been suggested on MyStarbucksIdea.com before. (Did you know there’s a website where you can submit an idea for Starbucks?). Here’s one idea called “Using Flavor Extracts” and another here. Edit: Just want to add, if I think Starbucks can get through a steep learning curve phase and figure out a way to have a more consistent dose of extract, this could be brilliant. It’s a great idea with some operational challenges. Starbucks pens, t-shirts, and more: The Coffee Gear Store. In order to maintain consistent order format, I would think customers would order a Tall Vanilla Flat White and it would be the standard recipe. The new flavor system would be a boon for anyone desiring to customize their drink and a non-issue for those who like the drink recipe as it is. Of course, this assumes that the ‘shake’ method is standardized. Otherwise as you mentioned, flavor could vary. I think this is a great idea, mostly because I don’t care for very sweet coffee and usually request fewer pumps of simple syrup whenever possible. I think my daughter and her friends, two of whom are diabetic, would also appreciate this and I hope it is tested widely so I can try it! I wonder what they’d do for things like the white chocolate syrup though. I can’t imagine an extract would work for some flavors as well when they don’t really have a natural source. I would love this. I would get the drink with just the extract and then put a Splenda in it. We have this in Sacramento area as well, ordered my carmal macchiatto that same way I always do. tasted amazing and I asked them about it. I am in Sacramento, where the entire district is being tested. I asked my barista about it and she said classic was being discontinued once they finished the formula for all of the frap bases to work with the simple syrup. Now, I have had frappacinos with the extract and simple syrup sweetener, but my daily shaken black tea has become a nightmare. I’ll admit, I am pretty particular about my drink: a Trenta black tea, 10 classic, no water, lite ice. I hadn’t had a my tea since they rolled out the ‘testing’ in February/March. My daily morning routine of mobile order was ruined. I tried working with the team to find a version of simple syrup or liquid cane sugar that could work, but no. I went to the Bay area for a week long conference and realized they had classic and I hugged the barista because I could order my drink. I’m pretty disappointed about the change, I’ve had to stop using mobile order and go in and talk to the shift lead about my order (using classic in my drink goes against the current policy). All in all, I’ve been a gold member for 7+ years, I spend over $3k on my Starbucks habit (slightly embarrassing when you add it up) and this might be the thing that finally makes me look elsewhere for my caffeine fix. I feel your pain so hard. I just moved to the Sacramento area and I was so confused why my very specific mobile order drink didn’t taste the same. Needless to say I’m heart broken over this change. Honestly, they simply separated the sugar and the flavor. The flavors are much more authentic, and are essentially used the same as the old in terms of how drinks are prepared. No need to be mad or unhappy. They taste absolutely awful. They just started yusing them in the St Louis market and I was unable to stomach two different tries they made. Fortunately the have the Kaldi’s coffee chain here in St Louis, because I don’t want to give up my coffee fix simply because Starbucks was shortsighted enough to say “oh hey, let’s screw up what everyone already likes” I will not be going back, it’s not just because I’m angry at their poor business decision, it’s because the new mix literally makes the drink have a cloying annoying after taste that makes it taste terrible. I tried chewing some gum for an hour and still tasted the aftertaste, it was that strong. Agreed! They are horrible here in St. Louis! Hopefully they will switch back! I totally agree as well!! The drinks I’ve ordered for years is now MUCH sweeter than it ever was before and the flavor has changed a bit too. I order it with 4 pumps of sweetener instead of 6 in the venti iced drink and it’s still just weird and gross. So annoyed. Really hope this doesn’t stick here in St. Louis. THANK YOU!!!! I have gone to every starbucks in my area of STL and told baristas that I hate it and won’t be ordering anything after they confirmed they’ve switched to the new recipe, it tastes terrible and I’m so bummed that they’ve messed with my morning coffee routine, I was a daily customer, now I’m scrounging around for licensed stores in dierbergs just to get my fix! Yes. This crap is nasty. Totally ruined three of my favorite drinks. I bought syrup from Amazon and will be making my tea latte from home from now on. The extracts are horrible. I refuse to go back to Starbucks unless they bring back the original syrup’s. I was a daily customer. I guess they have helped me save my money!! I hate the new flavors! I guess this will break my Starbucks addiction and save me a whole lot of money! I’ll either stick to coffee at home or invest in my own esspresso maker and customize my drinks at home. Thanks for breaking my expensive addiction Starbucks. HATE the new extracts. I have been a daily Starbucks customer for over 20 years – venti skinny vanilla latte. Sadly, I spend hundreds of dollars each month at Starbucks as my teenagers enjoy Starbucks too. I’m done. Threw away two coffees in two days as my regular shop just made the switch to the extracts -they are TERRIBLE. One of your barista’s was kind enough to spend a lot of time with me trying to make my drink with the extracts taste better – no success. May habit has been broken. Hate the new extracts. They are terrible in cold drinks. I had a two a day habit Green Tea with peppermint which I already adapted to when Starbucks dumped Tazo Green Tea. I fortunately found The Filling Station (local Bakersfield) that will make a Green Tea with peppermint syrup! No oil slick on the tongue! And the price is about the same! The new addin tastes horrible. I wish they would leave the original syrup option. My family’s going is looking for a new coffee place. Sorry Sarbucks. It was a good run. I’m in the Sacramento area & got a toffee nut latte that I swore someone spiked with alcohol! It was that strong! Then I saw a barista actually make my drink instead of using the drive thru & saw the new “shakers” when i asked for an extra pump(due to it not tasting good)! The iced drinks are a lot more palatable but over the last 2 nights I got 2 separate toffee nut lattes that were not anything like there classic drink! I am so happy that diabetics & other people have more customization but please bring us Starbucks classic lovers a Christmas miracle & give us the option to order our drinks “classic”! PLEASE!! Just keep both!! I see the benefit but it’s really gross in toffee nut! Has anyone had success with the extract in a hot espresso drink? Thanks! Bad Choice starbucks… Thanks for getting rid of your best customers with this NASTY change! You ruined it! This crap is just Nasty!! 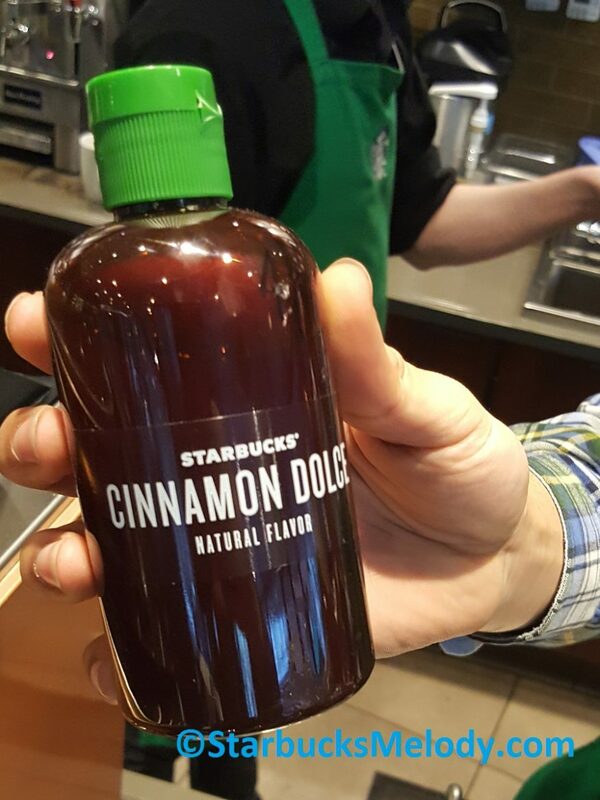 It leaves an after taste and let me tell you I’m a gold card holder and buy a coffee every day but since I have tasted this new change in flavoring, I can say to starbucks you lost many of your true customers to this change. It’s disgusting and the worst choice you have made! Good bye Starbucks and Hello Dutch Brothers! Sad to see starbucks changing to a NASTY flavoring system. Splenda is disgusting!! Just had this for the first time. Toffenut is nasty. Doesn’t taste anything like it . Plus whatever their made with made my tongue felt burnt. I had an iced latte. I will not be going back. I’ve drank these for years. Guess it’s time I try somewhere else. I’m hearing mixed messages from baristas in the licensed stores (PSA: YOU CAN GET ORIGINAL SYRUPS IN LICENSED LOCATIONS! )… that people love it or hate it and that it might not continue. I certainly hope it won’t continue, my caramel macchiato habit was a DAILY one, sometimes twice a day! The flavor extracts taste like artificial sweetener and there is no way to change that, the vanilla stays on your tongue the way xylitol and stevia do, which is extremely off-putting to me, I’m very sensitive to it. PLEASE FIX THIS STARBUCKS! I hate it I had them remake my drink 3 times then asked for my money back. My husband has asked me to break my Starbucks addition, well if all stores go to the it won’t be hard. Why fix what isn’t broken? I can no longer get a sugar free vanilla latte that is sweet. I’m sorry but a latte with vanilla extract and Splenda DOES NOT tase good. We have drank Starbucks iced vanilla lattes for over 6 years, and loved them. Now that the syrup has changed they make us sick to our stomach. We had to quit. And since I can’t buy the syrup anymore, I am giving my at home espresso machine away. To be not so nice about it, I am pissed off. The prices on Amazon are crazy and I have tried other syrups and found them to be lacking. My local area just switched to these syrup extracts. HORRIBLE and leave me with a terrible stomach issues. I have a pretty simple drink that I used to love. I think it’s time to stop my daily habit – I suppose thats the silver lining with this change. I’ve been getting a sugar free cinnamon dolche light frappachino for years and was informed yesterday that the light base has been discontinued. They tried concocting some screwy alternative and after one taste I gave it back to them and left. Thank you for curing my 25 dollar a week Starbucks habit! The new syrups or extracts whatever the correct term are awful. London fog ruined. My iced black tea sweetened with vanilla and an inch of half and half tasted so awful I had to toss it. Too sweet with almost a butterscotch taste. Bring back the old syrups please. Thank you. I agree. I usually get an iced black tea with vanilla. Ordered it today and it tasted like cotton candy. So gross! Not even close to what I am used to. My favorite drink is a sugar free vanilla latte, which I’ve been getting at Starbucks for 20 years. For medical reasons, which I didn’t have until I was 33 years old, I can’t drink regular sugar syrups. As someone said above, I certainly would not want Starbucks to take away all the sugar syrup options for everyone else, everyone should be able to enjoy their favorite drink. After all, we are paying for it. For me, I don’t want to be left out. When my friends order drinks, being able to order a sugar free vanilla latte means my medical condition does not separate me from going to Starbucks with my friends. I went last week and got a Starbucks sugar free vanilla latte in Irvine, CA, and it was fantastic. I went again yesterday to the same place, and was told they discontinued sugar free vanilla. I thought they were joking, but they were not. I was not told of the new extract options, so maybe they don’t have them yet. I didn’t buy anything, I was in shock and super sad. I heard Peet’s coffee has sugar free vanilla, I may have to check that out now instead. Or perhaps I can figure out how to get a non-fat latte and add the powdered vanilla at Starbucks and see how that tastes. The new extracts should be coming to OC soon. They’ve been in San Diego for about a week or two. I LOVE the option to make ANY flavor sugar free. Having a medical condition that requires me to have sugar free always made it difficult to go out to Starbucks with my friends. Now I can have anything I want. Woo Hoo! Starbucks Please Do Not change to these extracts, leave them as a test market item that failed. They are horrible. I’m a long time gold card member and while in the STL and in San Diego area I threw away multiple drink because I thought they were made wrong, then I found out they were testing out the new extracts. I think these extracts are a mistake, they taste horrible. 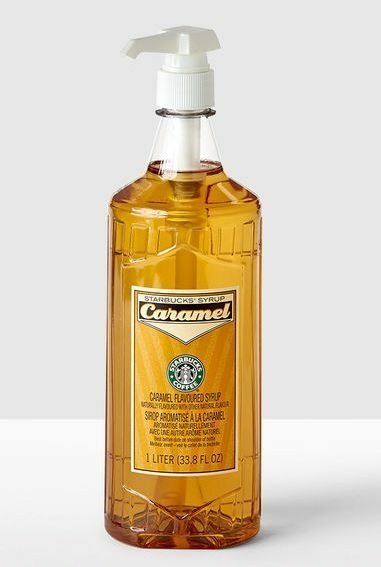 Starbucks, please bring back caramel syrups! Extracts can be offered to those who wish to have sugar free option. My mornings have been ruined by these extracts!! They are disgusting. Just bring back the sugar free syrups. If it ain’t broke don’t fix it. Making things more complicated than it needs to be. I liked the light base when ordering a frap. But it wasn’t sugar free it was less sugar. I’m now just making coffee at home. This change made it to Austin, TX. Thankfully, franchise SB [Target, Randall’s] still serve the classic way with pre-blended syrups. Otherwise, good thing I’m okay with standard ‘black coffee’. They are testing this out in Austin as well and its is DISGUSTING. Every drink tastes like I am drinking Lucky Charms from the syrups. It tastes absolutey disgusting and I am very disappointing they are changing the recipe so it can be cheaper for them and not as good tasting for us. Just came back to this post after leaving a comment 11 months ago when San Diego stores switched to the syrup extracts. I see the rollout continues. Bummer – Starbucks lost me as a daily 7 year customer as a result of the switch and honestly i have not been back since the change until I realized a few days ago i had $4 left on my gold card so i went down to the local starbucks in Target and ordered my old favorite just to clear my balance. Still a daily coffee drinker. I guess I was just wishfully thinking the company had reverted back to the old syrups. I’m sure the company has a reason, and it must be that there are more customers who favor the extracts than dislike them.